Welcome to the new Holiday Inn & Suites San Antonio Northwest.Discover all that San Antonio has to offer at the convenient, comfortable Holiday Inn & Suites San Antonio Northwest near UTSA. At our hotel, you will find modern luxury and contemporary southern hospitality. 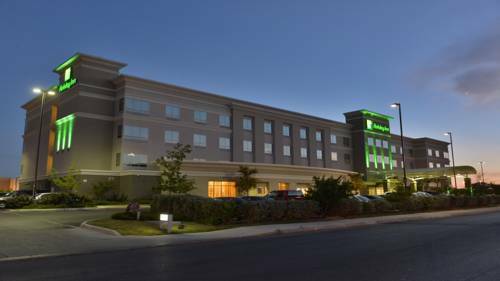 The Holiday Inn & Suites San Antonio near Six Flags is located at the heart of shopping, dining, entertainment and the arts in the Northwest corridor of San Antonio. We are located minutes from Six Flags Fiesta Texas, The Shops at La Cantera, The Rim Outdoor Mall, La Cantera Golf Resort, UTSA, USAA, Medical Center, Valero, KCI, NuStar, FBI Regional Offices, and many more. Getting here is fast and convenient too. Out Hotel boasts easy access to IH-10, Hwy 1604, Loop 410 and IH-35. We are about 10 miles north of the San Antonio International Airport, Downtown San Antonio and the Riverwalk.Whether you are coming to San Antonio for business or just for fun, your room at the Holiday Inn & Suites San Antonio near UTSA is your personal retreat. With amenities such as complimentary Wi-Fi Internet access, outdoor pool and Hot-Tub and Kems, our full service restaurant and bar; you'll have room to work, relax and make the most of your day. Kem's Restaurant offers your favorite comfort food items. Appetizers include sliders, wings, quesadillas, nachos, artichoke dip and chips. Our dinner items include hamburgers, grilled chicken sandwich, pizza or even healthy options like wraps and salads. Grand Ballroom has a total of 2,400 sq. ft. of meeting space which can be divided into three sections of 800 sq. ft., offering plenty of room for any type of meeting. We have on site audio visual services available as well as a fantastic onsite catering. Six Flags Fiesta Texas is a great amusement park. This park features over 60 exciting rides, shows and attractions including a water park. New in 2015 Batman The Ride. Be sure to ask the Front Desk Agents about our discounted tickets we have available.